The role of histamine as a newly recognized sympathetic neurotransmitter has been presented previously, and its postsynaptic effects greatly depended on the activities of sympathetic nerves. Cardiac sympathetic nerves become overactivated under acute myocardial ischemic conditions and release neurotransmitters in large amounts, inducing ventricular arrhythmia. Therefore, it is proposed that cardiac sympathetic histamine, in addition to norepinephrine, may have a significant arrhythmogenic effect. To test this hypothesis, we observed the release of cardiac sympathetic histamine and associated ventricular arrhythmogenesis that was induced by acute ischemia in isolated mouse hearts. 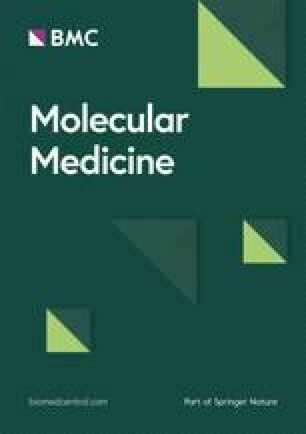 Mast cell-deficient mice (MCDM) and histidine decarboxylase knockout (HDC−/−) mice were used to exclude the potential involvement of mast cells. Electrical field stimulation and acute ischemia-reperfusion evoked chemical sympathectomy-sensitive histamine release from the hearts of both MCDM and wild-type (WT) mice but not from HDC−/− mice. The release of histamine from the hearts of MCDM and WT mice was associated with the development of acute ischemia-induced ventricular tachycardia and ventricular fibrillation. The incidence and duration of induced ventricular arrhythmias were found to decrease in the presence of the selective histamine H2 receptor antagonist famotidine. Additionally, the released histamine facilitated the arrhythmogenic effect of simultaneously released norepinephrine. We conclude that, under acute ischemic conditions, cardiac sympathetic histamine released by overactive sympathetic nerve terminals plays a certain arrhythmogenic role via H2 receptors. These findings provided novel insight into the pathophysiological roles of sympathetic histamine, which may be a new therapeutic target for acute ischemia-induced arrhythmias. G He, J Hu, and T Li contributed equally to this work. Supplementary material is available for this article at 10.2119/molmed.2011.00225 and is accessible for authorized users. Previous investigations have shown that endogenous histamine (HA) and HA receptors play highly significant roles in many cardiovascular diseases, such as hypertension (1,2), artherosclerosis (3, 4, 5) and chronic heart failure (6,7). Additionally, early reports found that cardiac HA and its receptors were important in the development of abnormal cardiac rhythms, especially those induced by ischemia reperfusion (8). More recently, it was reported that increased histaminergic tone could induce tachycardia via HA H2 receptors (9) and that sympathetic presynaptic H3 receptors are key modulating elements in ventricular arrhythmogenesis induced by ischemia reperfusion (10, 11, 12). Following the results of both fundamental and clinical investigations (6,7,13), corresponding HA receptors have therefore been proposed as new therapeutic targets for curing ischemic cardiovascular diseases. However, despite the consensus view that HA exerts an important influence on ischemic hearts, the origin of endogenous HA still remains unclear. Several previous reports have suggested that the cardiac endogenous HA originates from mast cells. In an ischemic state, cardiac mast cells are degranulated and release HA to induce arrhythmogenesis (8). However, mast cells are not the sole source of cardiac HA (14). Our previous findings indicated that cardiac sympathetic nerves also express HA and histidine decarboxylase (HDC), the rate-limiting enzyme in the synthesis of HA (15, 16, 17), and that sympathetic nerve terminals release HA upon appropriate stimulation (16,18, 19, 20). On the basis of these findings, we proposed HA to be a newly recognized sympathetic neurotransmitter. Furthermore, the postsynaptic effects of sympathetic HA have been found to be positively related to the firing activities of sympathetic nerves (19). The overactivation of cardiac sympathetic nerves in ischemic hearts, as reported in previous studies, further correlates with ischemia-induced ventricular arrhythmias (11, 12, 13,21,22). Therefore, it is rational to speculate that sympathetic HA, in addition to norepinephrine (NE), is also released and plays certain pathophysiological roles in ischemia-induced ventricular arrhythmias. In the present study, mast cell-deficient mice (MCDM) and HDC knockout (HDC−/−) mice were used to test the aforementioned hypothesis and to further clarify the pathophysiological roles of cardiac sympathetic HA. MCDM (Wads c-kit mutant mice) were provided by Dr. Xiang Gao of Model Animal Research Center of Nanjing University (Nanjing, China). HDC−/− mice used in the present study were provided by H Ohtsu. Both strains had a pure C57BL/6 genetic background. C57BL/6 mice were used as the wild-type (WT) controls. All experiments and animal care procedures were reviewed and approved by the Animal Resource Center of the Fourth Military Medical University, in accordance with the National Institutes of Health Guide for the Care and Use of Laboratory Animals (NIH publication number 8023, revised 1978). Hearts dissected from WT, homozygotes of MCDM and HDC−/− mice were fixed using Bouin fixative. The hearts were dehydrated in rising concentrations of ethanol, embedded in paraffin and sectioned (4 µm). Mouse anti-tryptase monoclonal antibody (1:200 dilution; Abcam), biotinylated goat anti-mouse antibody (1:20 dilution; Sigma, St. Louis, MO, USA) and ExtrAvidin Peroxidase (1:20 dilution; Sigma) were used for mast cell identification. Positive staining was detected with 0.05% diaminobenzidine/0.01% H2O2 in 0.05 mol/L Tris-HCl buffer. Superior cervical ganglions (SCGs) obtained from the same mice were also sectioned, and double immunofluorescence staining was performed. Briefly, SCG sections were incubated with a mixture of rabbit anti-HA polyclonal antibody (1:1,000 dilution; Sigma) and mouse anti-dopamine β hydroxylase (DβH) monoclonal antibody (1:1,000 dilution; Incstar, Stillwater, MN, USA) for 24 h at 4°C. The incubation medium was prepared using 0.05 mol/L phosphate-buffered saline (PBS) containing 0.5% (v/v) Triton X-100, 0.25% (w/v) L-carrageenan, 0.05% (w/v) NaN3 and 0.5% (v/v) normal goat serum. After rinsing three times in PBS, the slides were incubated overnight at room temperature in the secondary antibodies (fluorescein isothiocyanate [FITC]-conjugated goat anti-mouse IgG and Texas Red-conjugated goat anti-rabbit IgG), in a 1:200 dilution with 0.05 mol/L PBS containing 0.3% (v/v) Triton X-100 (PBS-T). Slides were then rinsed in PBS and cover-slipped with a mixture of 50% (v/v) glycerin and 2.5% (w/v) triethylene diamine (antifading agent) in 0.05 mol/L PBS and examined with a fluorescence microscope (Olympus FV300; Olympus, Tokyo, Japan) under excitation wavelengths of 543 and 488 nm. In the control experiments, one of the primary antibodies was omitted and replaced with normal IgG or the corresponding preneutralized antibody. No immunoreactivity for the replaced or neutralized antibody was found. Mice weighing 30–35 g were sacrificed by cervical dislocation under deep CO2 anesthesia. Hearts were quickly dissected and placed in ice-cold Krebs-Henseleit (KH) solution with the following composition (mmol/L): NaCl 118, KCl 4.7, MgCl2 1.2, CaCl2 2.5, NaHCO3 25, KH2PO4 1.2 and glucose 11 (pH 7.4) and quickly cleared of surrounding excess tissues. The aorta of each heart was cannulated with a flanged stainless-steel needle, and the heart was perfused with KH solution at 37°C and constant pressure (100 cm H2O). The solution contained 1 µmol/L atropine and 0.1 µmol/L desipramine and was equilibrated with 95% O2 and 5% CO2. Only hearts with an initially stable sinus rhythm were considered for further experiments. The coronary effluents were collected every 5 min, and coronary HA and NE overflows were measured simultaneously by high-performance liquid chromatography with electrochemical detection, as previously described (23). Hearts were weighed after the experiments for result standardization, quickly frozen with liquid nitrogen and stored at −80°C before cyclic adenosine 3′,5′-cyclic monophosphate (cAMP) assaying. Electrical field stimulation (EFS) experiments were performed according to previous studies (21). After perfusion with KH solution and equilibration for 30 min, two stainless steel paddles were apposed to the heart with their stimulating surface parallel to the interventricular septum. EFS was performed for 60 s at 2, 4 or 8 Hz with pulse duration of 1 ms and voltage of 5 V, generated by PowerLab/8SP (ADInstruments). Each tissue was stimulated at one of the selected frequencies only. After 30-min stabilization, hearts were subjected to 10-, 20-, or 30-min stop-flow normothermic global ischemia followed by a 30-min reperfusion. Surface electrocardiograms were obtained using two electrodes with one attached to the aortic cannula and the other to the apex of the left ventricle (recorded online with recording frequency of 4 kHz, analyzed with PowerLab/8SP). According to previous studies (24), the electrode was purpose-built with a small (approximately 1 mm) bare silver ball to achieve steady contact between the electrode and the heart, ensuring minimal movement occurred. The coronary HA overflow was measured and the incidence and duration of reperfusion arrhythmias were calculated according to the Lambeth Conventions (25). In experiments to exhaust endogenous HA, 50 mg/kg α-fluoromethylhistidine (αFMH) was injected intraperitoneally 2 h before the study (26). To explore the effects of the antagonists, the reagents were applied 10 min before ischemia and continuously perfused until the end of the 30-min reperfusion. Vehicles were used as controls. To explore the effects of exogenous HA and/or NE, the corresponding reagents were applied for 5 min. The surface ECGs were recorded soon after the application of HA and/or NE for a duration of 30 min. To denervate sympathetic nerves, 6-hydroxydopamine (6-OHDA) was dissolved in saline containing 0.1% ascorbic acid, and mice were treated as previously mentioned (16). Briefly, 6-OHDA was injected through the caudal vein with 50 mg/kg on d 1 and 100 mg/kg 6-OHDA on d 7. For the control experiments, solutions containing only 0.1% ascorbic acid in saline were used. Mice were sacrificed for study 7 d after the final injection. To measure myocardial cAMP levels, each sample was homogenized mechanically in frozen PBS (pH = 7.4) with a mechanical homogenizer. The homogenate was thawed and centrifuged at 5,000g at room temperature for 15 min, and the 100-mL aliquots of supernatant were subjected to the assay. Levels of cAMP were determined by enzyme-linked immunosorbent assay (Biotrak EIA, Amersham Pharmacia Biotech, Bucks, UK). Atenolol, biotinylated secondary antibody, famotidine, FITC-conjugated secondary antibody, HA, HA antibody, 6-hydroxydopamine and NE were from Sigma. DβH antibody was from Incstar. Texas Red-conjugated antibody was from Molecular Probes (Eugene, OR, USA). Tryptase antibody was from Abcam (Cambridge, UK). a-Fluoromethylhistidine was provided by C Kamei (Okayama University, Japan). Values were expressed as mean ± standard deviation (SD), and statistical differences between groups were determined by the χ2 test, Student t test or analysis of variance (ANOVA) followed by Student-Newman-Keuls t test where necessary. A value of P < 0.05 was considered statistically significant. The coat color of heterozygous MCDM is black with white spots, whereas that of homozygous MCDM is pure white with eyes remaining black (27). The staining of tryptase, a specific marker of mast cells, showed that heart sections from WT and HDC−/− mice expressed a number of mast cells (Figures 1A1, C1), but none were found in the hearts of the homozygote of MCDM (Figure 1B1). HA-like immunopositive signals were found to be present in SCG neurons of the same WT mice and homozygote of MCDM (Figures 1A3, B3), but were absent in the HDC−/− mice (Figure 1C3). 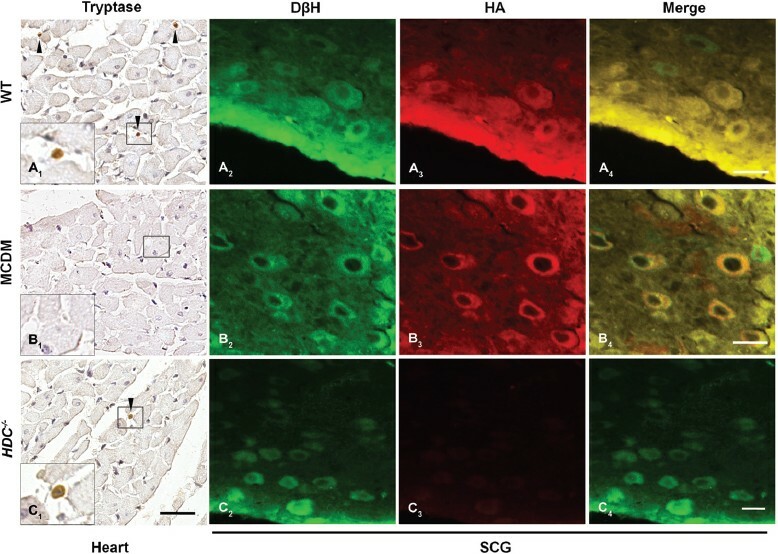 Morphological evaluation of hearts and SCG neurons from WT (A), MCDM (B) and HDC-/- mice (C). Heart and SCGs were obtained from the same mouse. Black arrowheads identify mast cells. Magnified images of the boxed areas are shown in the bottom left of the corresponding panels (A1, B1 and C1). No positive staining of tryptase was found in MCDM sections (B1). SCG sections were double stained with antibody to DβH (green) and HA (red). All mice strains were positive for DβH (A2, B2 and C2). Majority of WT mice and MCDM SCG neurons were simultaneously positive for HA (A3–4 and B3–4), whereas HDC-/- SCG sections were negative for HA (C3). Experiments were repeated in three mice from each strain, and five sections of heart or SCG from each one mouse were observed. Scale bar, 50 µm. Table 1 shows the basic parameters of isolated hearts from the three phenotypes of mice and indicates that there were no significant differences among the groups. As shown in Figure 2A1, EFS frequency-dependently evoked HA release from Langendorff-perfused hearts of WT mice and MCDM. No significant differences in HA overflow were observed between the two groups. 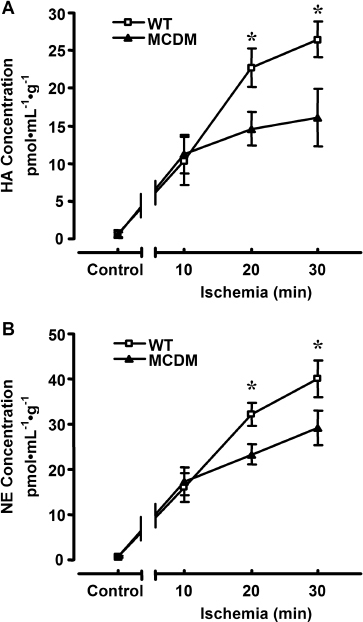 A 10-min period of acute global stop-flow ischemia induced a similar amount of HA release from isolated hearts of WT mice and MCDM after reperfusion (Figure 2B1). The HA concentration in coronary effluents peaked in the first 5 min of reperfusion and decreased thereafter. 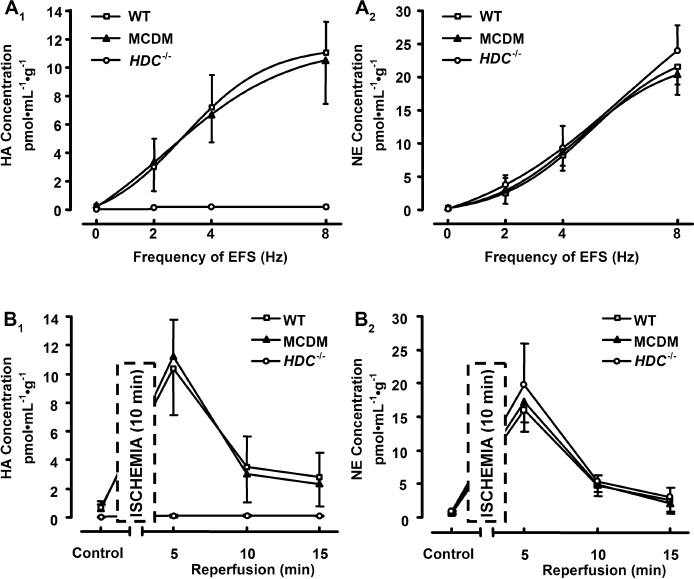 Neither EFS nor ischemia evoked significant HA release in HDC−/− mice. However, coronary NE overflow induced by EFS or acute ischemia exhibited a similar pattern among the three mouse strains, being slightly higher in HDC−/− mice (Figures 2A2, B2). Basic parameters of perfused isolated hearts of WT mice, MCDM and HDC−/− mice. Coronary HA and NE overflows from perfused mice isolated hearts. (A) Effect of EFS on coronary HA (A1) and NE overflows (A2) in WT, MCDM and HDC−/− mouse hearts. Each point represents the mean ± SD value of HA or NE concentration in the first 5 min of coronary effluent after EFS (n = 5). (B) Effect of global stop-flow ischemia followed with reperfusion on coronary HA (B1) and NE overflows (B2) in WT, MCDM and HDC−/− mouse hearts. Ischemia was applied for 10 min after an initial stabilization period of 30 min. Each point represents the mean ± SD value of HA concentration in the coronary effluent after reperfusion (n = 12–15). To explore coronary HA and NE overflows upon acute or prolonged global ischemia, different time courses of stop-flow (10, 20 or 30 min) were applied. As shown in Figure 3, no significant differences were observed in the coronary HA (A) and NE (B) overflows in the first 5 min of reperfusion between WT mice and MCDM after 10 min of ischemia. However, when the time courses of stop-flow were increased to over 20 min, the coronary HA and NE overflows of WT mice group were significantly greater than those of the MCDM group. Effect of different durations of global stop-flow ischemia on coronary HA (A) and NE overflows (B) from WT and MCDM hearts after reperfusion. Ischemia was applied for 10, 20 or 30 min after an initial stabilization period of 30 min. Each point represents the mean ± SD value of HA concentration in the coronary effluent in the first 5 min of reperfusion. *P < 0.05 between hearts of different phenotypes subjected to the same ischemia time by ANOVA followed by a Student-Newman-Keuls t test (n = 5). The coronary HA and NE overflows induced by EFS in WT mice and MCDM were almost entirely eliminated when mice were pretreated with 6-OHDA (Figures 4A1, A2). Similarly, pretreatment with 6-OHDA also eliminated acute ischemia-induced coronary HA and NE overflows (Figures 4B1, B2). 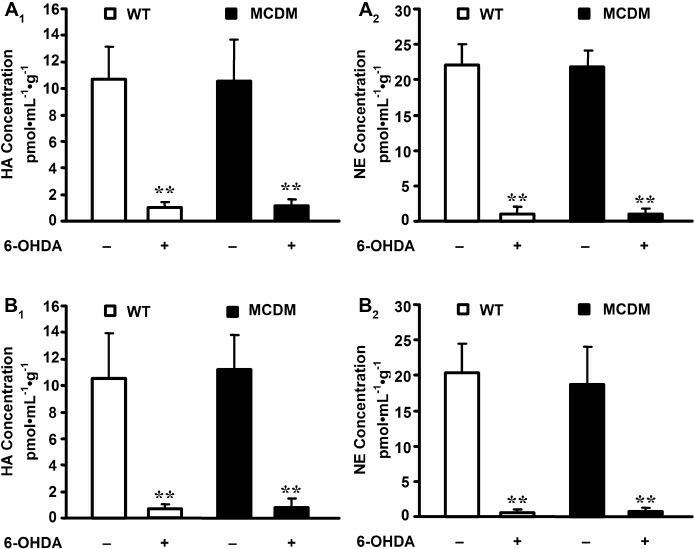 Effect of 6-OHDA on EFS (A) and global stop-flow ischemia (B) induced coronary HA and NE overflows in WT mice and MCDM. (A) The frequency of EFS applied was 8 Hz for 60 s with pulse duration of 1 ms. Bars represent the mean ± SD values of HA (A1) and NE (A2) concentrations in the first 5 min of coronary effluent after EFS. (B) Ischemia was applied for 10 min after an initial stabilization period of 30 min. Bars represent the mean ± SD values of HA (B1) and NE (B2) concentrations in the coronary effluent in the first 5 min of reperfusion. **P < 0.01 versus the 6-OHDA untreated group of corresponding phenotype by Student t test (n = 5). 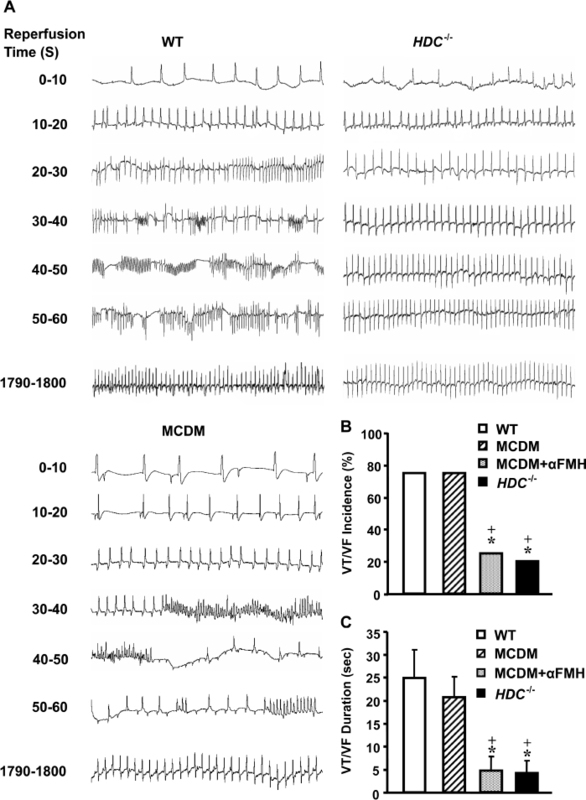 Representative ECG recordings from one WT mouse, MCDM or HDC−/− mouse after reperfusion are shown in Figure 5A. Ischemia for 10 min resulted in the occurrence of ventricular tachycardia (VT) and/or ventricular fibrillation (VF) in WT mice and MCDM groups after reperfusion. The rhythm became irregular during the first minute of reperfusion and gradually returned to regular sinus rhythm thereafter. In the HDC−/−mice group, the incidence and duration of VT and/or VF induced by ischemia was markedly reduced (Figures 5B, C). Furthermore, after pretreatment with αFMH, the coronary HA overflow in MCDM after ischemia was markedly decreased (see Supplementary Figure S1) with the incidence and duration of VT and/or VF reduced to the level of the HDC−/− mice group (Figures 5B, C). Effect of global stop-flow ischemia on ventricular arrhythmias in mice isolated hearts during a 30-min reperfusion. Ischemia was applied for 10 min after an initial stabilization period of 30 min. (A) ECG tracings from one heart of WT, MCDM and HDC−/−mouse, respectively, showing the first 60 s and the last 10 s of the 30-min reperfusion. (B) The incidence of VT and VF is expressed as percentages of the total number of hearts used in each group. Bars represent the percentage values; *P < 0.05 versus WT group and +P < 0.05 versus the MCDM group by χ2 test. (C) Duration of VT and VF represents the cumulative duration of arrhythmia during the 30-min reperfusion. Bars represent the mean ± SD values of duration time. *P < 0.05 versus WT group, +P < 0.05 versus MCDM group by ANOVA followed by Student-Newman-Keuls t test (n = 12–15). To explore the effects of atenolol and famotidine on the incidence and duration of VT and/or VF, selective β1 adrenoceptor antagonist atenolol (1 µmol/L) and selective H2 receptor antagonist famotidine (100 nmol/L) were used either alone or in combination. When used alone, each of these two drugs only marginally (not significantly) reduced the incidence of VT and/or VF but markedly shortened the VT and/or VF duration (72.5% decrease in WT mice, 63.2% decrease in MCDM; P < 0.05). However, when used in combination, both the incidence and duration of VT and/or VF were significantly reduced (Figures 6A, B). Furthermore, these two drugs affected neither the coronary HA overflow (Figure 6C) nor the other basic parameters of perfused isolated hearts, including the initial normal sinus rhythm and the coronary NE overflow (data not shown). Effect of atenolol and famotidine, alone and in combination, on ventricular arrhythmias induced by global stop-flow ischemia in isolated hearts of WT mice and MCDM mice during a 30-min reperfusion. Ischemia was applied for 10 min after an initial stabilization period of 30 min. (A) The incidence of VT and VF is expressed as percentages of the total number of hearts used in each group. Bars represent the percentage values. *P < 0.05 versus untreated group; +P < 0.05 versus either atenolol alone or famotidine alone group by χ2 test. (B) The duration of VT and VF represents the cumulative duration of arrhythmia during the 30-min reperfusion. Bars represent the mean ± SD values of duration time. *P < 0.05 versus untreated group; +P < 0.05 versus either atenolol alone or famotidine alone group by ANOVA followed by Student-Newman-Keuls t test. (C) Effect of atenolol and famotidine, alone or in combination, on coronary HA overflow obtained from the same isolated hearts as in (A) and (B). Bars represent the mean ± SD values of HA concentrations in the coronary effluent in the first 5 min of reperfusion (n = 10–12). Exogenous application of either HA (1 µmol/L) or NE (1 pmol/L) independently induced ventricular arrhythmogenesis in WT mice and MCDM isolated hearts with a respective incidence of 100% (n = 5). When used in combination, synergism was observed between the arrhythmogenic effect of HA and NE. Specifically, the durations of VT and/or VF induced by NE together with HA were markedly prolonged (219% increase in WT mice, 234% increase in MCDM), which was longer than the sum of VT and/or VF durations induced by HA and NE independently (Figures 7A, B). 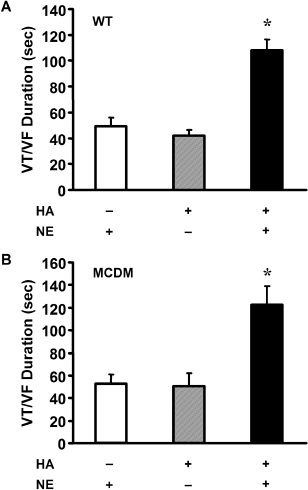 Effect of HA and NE, alone and in combination, on ventricular arrhythmogenesis in isolated hearts of WT mice (A) and MCDM mice (B). Exogenous reagents were applied for 5 min after an initial stabilization period of 30 min. Surface ECG recording began when exogenous reagents were applied and lasted for 30 min. Bars represent the mean ± SD values of duration time. *P < 0.05 versus respective HA or NE treatment group by ANOVA followed by Student-Newman-Keuls t test (n = 5). At the end of the 30-min reperfusion, the cardiac cAMP levels in hearts of the three strains of mice were all significantly increased compared with the corresponding preischemia control groups. 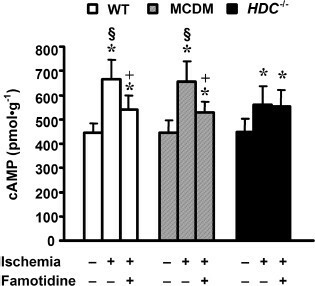 Pretreatment with famotidine markedly reduced the increased cardiac cAMP levels in WT mice and MCDM groups, but did not significantly affect the increased cAMP level in the HDC−/− mice group (Figure 8). Myocardial cAMP levels in isolated hearts of WT, MCDM and HDC−/−mice. The basal groups of myocardial cAMP levels were obtained from hearts without being subjected to global stop-flow ischemia. The ischemia-induced myocardial cAMP levels were obtained from hearts subjected to a 10-min global stop-flow ischemia followed by 30-min reperfusion with or without famotidine treatment. Bars represent the mean ± SD values of cAMP levels. *P < 0.05 versus corresponding basal group; +P < 0.05 versus corresponding famotidine untreated group; §P < 0.05 versus famotidine untreated group of HDC-/- mice by ANOVA followed by Student-Newman-Keuls t test (n = 8–12). Cardiac mast cells are a well-acknowledged source of cardiac HA (28). However, the morphological results from the present study consistently show that HA is also present in the SCGs of MCDM and absent in HDC−/− mice. This strongly indicates that sympathetic HA is synthesized and stored independently of mast cells and is in support of previous work, which found HA present in cardiac sympathetic axons and varicosities projected from SCGs (16). Therefore, the MCDM model is ideal for studying the functions of cardiac sympathetic HA, and the HDC−/− mice, which do not express HA, are also appropriate as negative controls. The results of previous studies have shown that with appropriate stimulation, such as EFS (21) and acute ischemia (11,13,21), cardiac sympathetic nerve terminals are activated, triggering neurotransmitter release. In the present study, such stimulations also evoked mast cell-independent HA overflow. To clarify the origin of HA, we performed chemical sympathectomy with 6-OHDA and achieved cardiac sympathectomy, as indicated by diminished NE release. HA release was found to be sensitive to 6-OHDA pretreatment, firmly suggesting a sympathetic neural origin. The NE release induced by EFS or ischemia in the present study is in accordance with previous reports (11, 12, 13,21) and remained high in HDC−/− mice, which confirmed the activation of cardiac sympathetic nerve terminals. The slightly (but not significantly) increased coronary NE overflow in HDC−/− mice may be due to the lack of endogenous HA required to activate sympathetic presynaptic H3 receptors, which in turn exert an inhibitory effect on NE release (11, 12, 13,16). However, since H3 receptors have been reported to show constitutive activity in absence of an agonist (29), the NE overflow from HDC−/− mice is unlikely to increase as significantly as that in H3 receptor knockout mice (11). The choice of a 10-min global stop-flow period instead of the more frequently used 30 min (including the cardiac creatine phosphate kinase [CPK]) release data; see Supplementary Figure S2) was because prolonged ischemia (>10 min) caused significant mast cell activation and severe adverse cellular injury. This step not only releases HA but also triggers NE, one of the most important arrhythmogenic factors, released via the local renin system (30). Mast cell activation and severe cellular injury would significantly complicate interpretation of the present results. Therefore, to simplify the experimental model and focus on the pathophysiological roles of cardiac sympathetic HA, we investigated short-lived acute myocardial ischemia using a 10-min ischemia period, during which time barely any biochemical and cellular changes were observed. Further research is recommended to clarify the nature of cardiac HA release in protracted myocardial ischemia. Cardiac H2 receptors mediate positive chronotropic and inotropic effects (9,31, 32, 33). In the present study, the selective H2 receptor antagonist famotidine was found to slightly decrease the incidence of ischemia-induced ventricular arrhythmia and markedly reduced the duration. This result was evidently a postsynaptic effect, since famotidine did not affect sympathetic HA release. This result is in accordance with previous studies, in which certain H2 receptor antagonists have been found to exhibit a cardiac protecting effect in ischemic heart diseases, including antiarrhythmia (6,7,9,34). Moreover, results in the present study confirm the mediating role of the H2 receptor (35,36) and indicate the therapeutic potential of its antagonist in treatment of ischemia-induced ventricular arrhythmias. Furthermore, our experiments show that famotidine did not fully reduce cardiac cAMP to the preischemia level. One possible reason for this is that NE, which is released simultaneously, plays an important role in triggering the rise of cardiac cAMP levels, via postsynaptic β1 adrenoreceptors and in inducing positive chronotropic and inotropic effects. This is the basis for the clinical use of β adrenoreceptor antagonists in the treatment of ischemia-induced arrhythmias (37). The finding that the selective β1 adrenoreceptor antagonist atenolol used independently exhibited a similar antiarrhythmic effect to famotidine but when used in combination, a stronger antiarrhythmic effect was observed, confirms the hypothesis that cardiac sympathetic HA facilitates the arrhythmogenic effect of NE. This finding is consistent with the results of previous research, which showed that the postsynaptic effect of NE is facilitated by sympathetic HA in guinea pig vas deferens (19) and is because both the β1 adrenoreceptor (38) and the H2 receptor (35) are Gs protein coupled receptors, sharing the same second messenger. While the present study has investigated the relationship between HA and ischemia-induced arrhythmogenesis, HA is only one of the arrhythmogenic factors, and the arrhythmogenic roles of many other factors (such as renin, angiotensin, endothelins and so on) still require clarification. Furthermore, although the cardiac protection effect of H2 receptor antagonists is reasonably well established from previous investigations (28,39) and the present study, the origin of cardiac HA after prolonged ischemia is complicated, and the relationship between the effects of HA from different origins remains uncertain. This issue is likely to prove a valuable area of research for future investigations in this field. In summary, the present study has demonstrated for the first time that cardiac sympathetic HA plays a certain arrhythmogenic role in acute myocardial ischemia, via postsynaptic H2 receptors. These findings provide considerable insight into the pathophysiological function of cardiac sympathetic HA and H2 receptors and offer novel experimental evidence in the search for therapeutic targets to cure acute ischemia-induced arrhythmias. The authors want to thank Xiang Gao and his associates of Model Animal Research Center of Nanjing University for their kind provision of Wads c-kit mutant mice (mast cell-deficient mice). This work was supported by grants from the National Natural Science Foundation of China (30770669 and 30800310) and the National Science Foundation for Post-doctoral Scientists of China (20090451521).